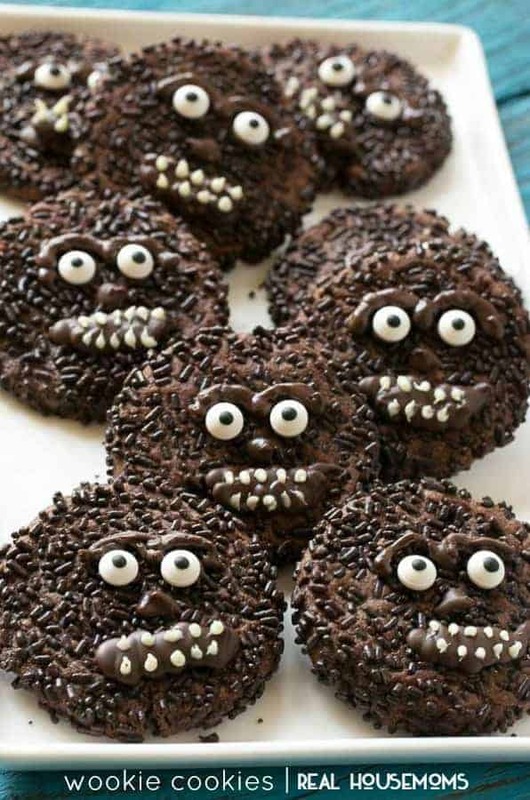 These chocolate wookie cookies are a fun and delicious treat for the Star Wars lovers in your life! Do you have a certain someone in your life that loves Star Wars? 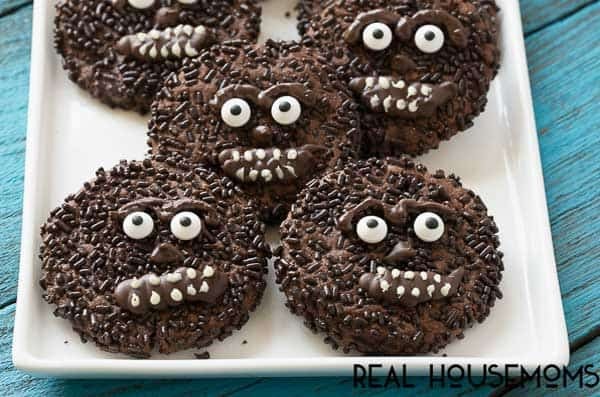 These wookie cookies are the perfect way to put a smile on their face. Chocolate cookies are decorated with even more chocolate for a cute treat that also happens to be delicious. The base of this recipe is a dark chocolate cookie which is rolled in chocolate sprinkles to represent all of that wookie hair. The faces are drawn on with dark and white chocolate and candy eyes add the final finishing touch. These cookies come out best if you use a piping bag with a metal tip so that you have the most control over your detail work. If you don’t have a piping bag you can always use a large resealable freezer bag with one corner snipped off. 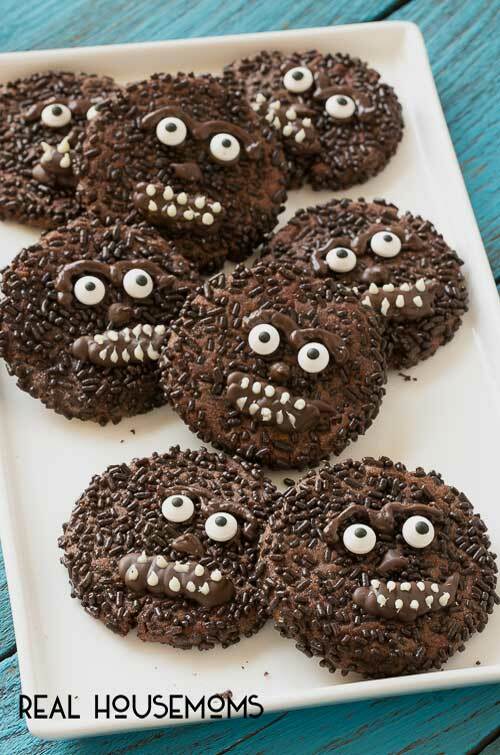 I served these wookie cookies for a play date and I’m pretty sure the kids thought I was the coolest mom ever. These cookies would be perfect for a Star Wars birthday party or even a movie viewing party. No matter how you serve them, you’re guaranteed to have some happy kids (or adults!). 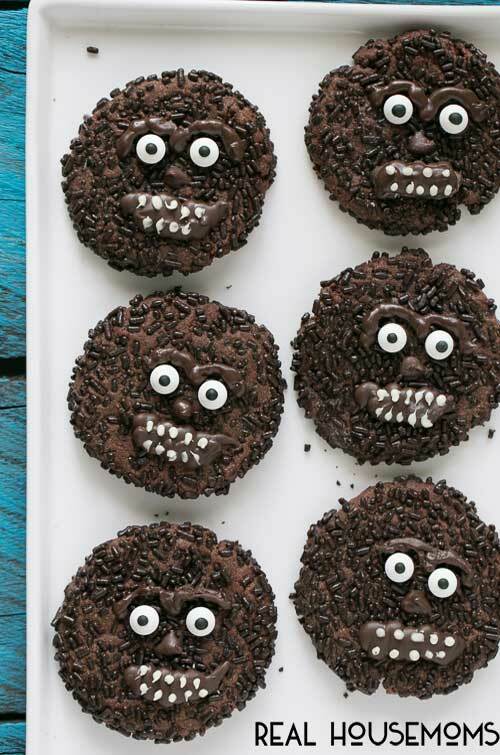 These chocolate wookie cookies are a fun and delicious dessert for Star Wars fans. Preheat oven to 350 degrees. Sift the flour, cocoa powder, and salt into a small bowl. Cream butter and sugar with a mixer until pale and fluffy, about 2-3 minutes. Add the yolks, milk, and vanilla; beat for 1-2 minutes or until thoroughly incorporated. Scrape sides of bowl. Beat in flour mixture until just combined. Pour the sprinkles onto a plate. Take one tablespoon of dough and roll it into a ball, then roll the ball in the sprinkles until thoroughly coated. Repeat with remaining dough. Place the balls of dough 2 inches apart on parchment-lined baking sheets. Using the bottom of a drinking glass coated in cooking spray, gently press down on each cookie to flatten it. Bake for 11-13 minutes or until cookies are set. Let cool slightly on baking sheets. Transfer cookies to wire racks and let cool completely. Place the dark chocolate melts or almond bark in a bowl and microwave at 30 second intervals, stirring in between each interval until melted. Pour the melted chocolate into a piping bag fitted with a small round tip. Alternatively you can use a resealable freezer bag with a corner snipped off. Pipe a dot of chocolate onto the back of each candy eye and place the eyes onto the cookies. Pipe on the eyebrows, nose and mouth. Let the chocolate dry completely. Place the white chocolate melts or almond bark in a bowl and microwave at 30 second intervals, stirring in between each interval until melted. Pour the melted chocolate into a piping bag fitted with a small round tip. Alternatively you can use a resealable freezer bag with a corner snipped off. Pipe the teeth on top of the chocolate mouth. Let dry completely. The cookies can be served immediately or stored at room temperature for up to 2 days. With 3 kids aged 4 and under, dinner can feel like feeding time at the zoo. I'm Sara, a foodie turned mom and I traded in elaborate meals on white linens for simple, yet delicious dishes to please to palates of my growling girls. When I'm not in the kitchen I enjoy crafting, photography, and outdoor activities.